Often said to be 'Australia's first inland city', Goulburn is the main centre for the fertile pastoral lands around the headwaters of the Wollondilly River, in the Southern Highlands of New South Wales. This is important sheep and wool country, but other agricultural products and gold also feature in the rich local history. The Goulburn area is the traditional country of the Gundungurra people, whose lands stretch northwards into the rugged southern Blue Mountains. Goulburn is centrally located for a number of natural attractions, including Bungonia Gorge (Bungonia State Conservation Area), Morton National Park and Wombeyan Caves. The rolling high country of the Southern Highlands falls away abruptly to the east into the gorges and broken plateaus of the Great Escarpment and the catchment of the Shoalhaven River. 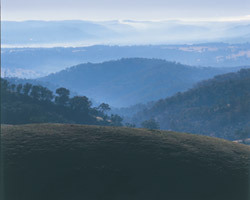 Rural landscapes give way on the escarpment to forested bushland, much of which is protected in a string of national parks and other reserves. To the west, the Great Divide slopes off much more gradually. The topography becomes slowly more subdued as the and Lachlan and Murrumbidgee Rivers gather waters and flow to the west. But the Wollondilly River is rather unusual. It rises south of Goulburn near Lake George and runs northwards and parallel to the Great Divide, past Goulburn and Mittagong to become a major tributary of the Hawkesbury River. But before it gets there it cuts through the wild country of the southern Blue Mountains to the cliff-walled Burragorang Valley, where it provides a major input to Lake Burragorang and Sydney's water supply. The Wollondilly River intimately links the Goulburn area with the Greater Blue Mountains.